Hi, Good Afternoon. Thank You, friends and viewers. Today I will post how to make Atukula Pulihora recipe. Karthika Masam or Karthigam is going on. This starts from the next day of Diwali festival. During the month-long period, some people follow fasting in the day.After the sun set or the dusk falls, lit the lights and eat very light, easily digestible food. That will be their first and only meal of the day. Those who cannot do it for the full month follow it for Mondays of this month. In my home, we perform a puja on the next day of Ekadashi i.e. 11th day of the month or two days before full moon day. It is the twelveth day of the month and it is called KSHEERABDhI DWADASHI or CHILUKA DWADASHI. We perform puja to Tulasi,Amla plants and offer naivedyam to it. 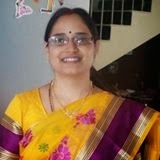 We have to offer mainly atukula pulihora and curd poha as naivedyam and rest of dishes is our choice. Normally we offer these two and have them in dinner, so we can skip any more cooking. Normally Chandra and I both together make it and do the puja. Today she did cooking part and I clicked. We call them pulusu atukulu or atukula pulihora as it is made just like normal tamarind rice or pulihora. 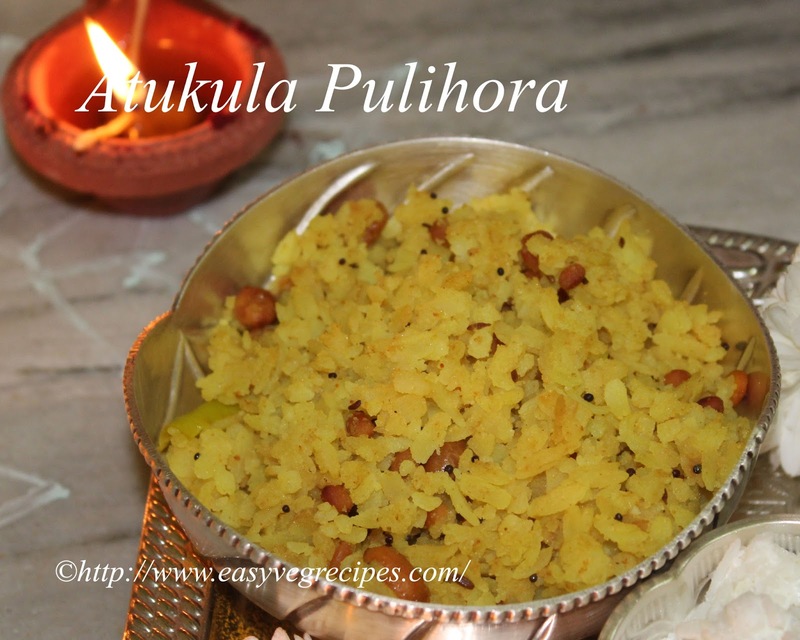 Atukulu or poha occupies the place of rice. For tamarind rice or pulihora we need to cook rice, but for this just soak poha in water for two to three minutes and add it to the tamarind tadka. Curd Poha is simpler, just add tadka and curd to the soaked poha. It tastes like curd rice. I will post that recipe also very soon. We cannot take exact measurements for atukula pulihora. We plan to do two cups of it and end up in doing four to five cups of it. So adjust measurements accordingly. I do not use any cup to measure, instead take a handfull of poha for each person. If we are six people I take six handfuls of poha and a little more. This may vary some times depending on the way we consume it, but it is almost suffiecient to six people. 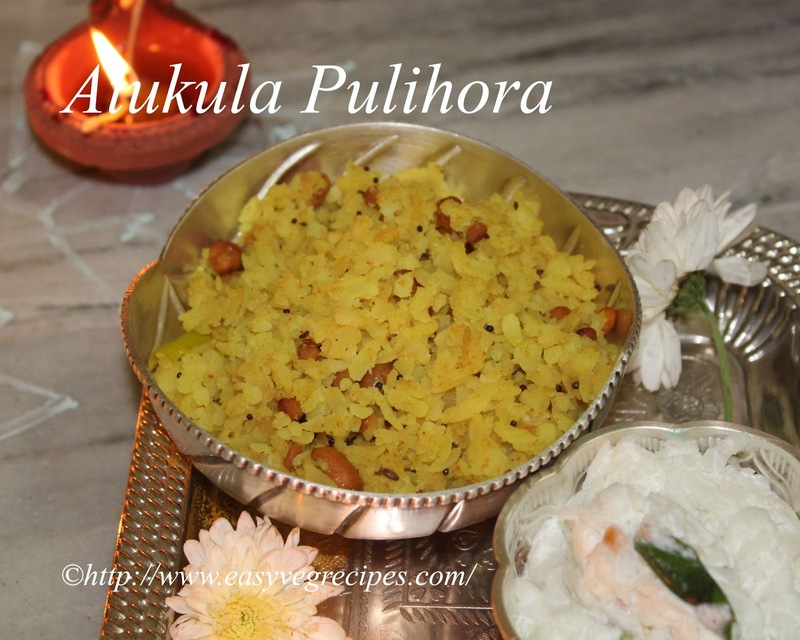 Atukula Pulihora -- A substitue to tamarind rice. Heat oil in a thick kadai, fry groundnuts, black gram and bengal gram. Fry them till they turn into light brown. Add mustard seeds, cumin seeds and red chilli. When they start spluttering add chopped ginger, green chillies and curry leaves. Add turmeric powder and asafoetida to it. Slowly and carefully pour squeezed tamarind juice to it. Add salt to it. Allow this to cook till the oil oozes out and the tamarind juce thickens. Meanwhile, soak poha/atukulu for five to seven minutes. Drain it and sqeeze out excess water. Once the tamarind juice thickens, switch off the flame and add the poha to it and mix well. For more rice recipes click here.Thank you for visiting my blog. Hope you liked all my recipes. Any feedback and comments are appreciated.